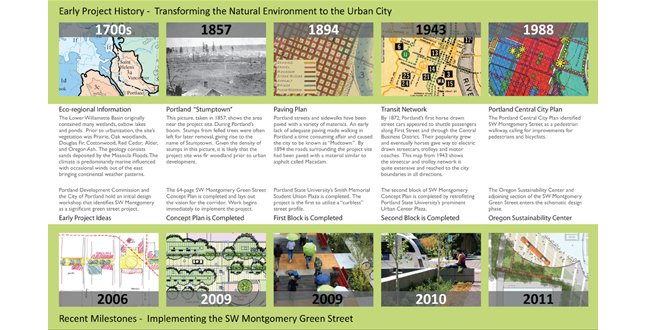 The SW Montgomery Green Street is regarded as Portland’s most innovative green street effort. The project demonstrates how, in even the most ultra-urban conditions, downtown streets can be planned and retrofitted not only to fully manage stormwater runoff but to also create, integrate, and preserve vibrant pedestrian spaces. 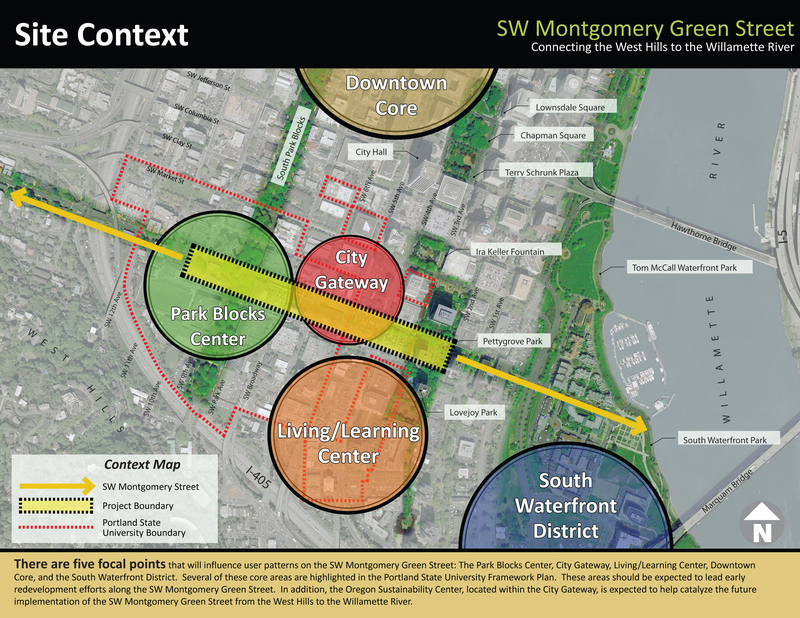 There are five focal points that will influence user patterns on the SW Montgomery Green Street: The Park Blocks Center, City Gateway, Living/Learning Center, Downtown Core, and the South Waterfront District. 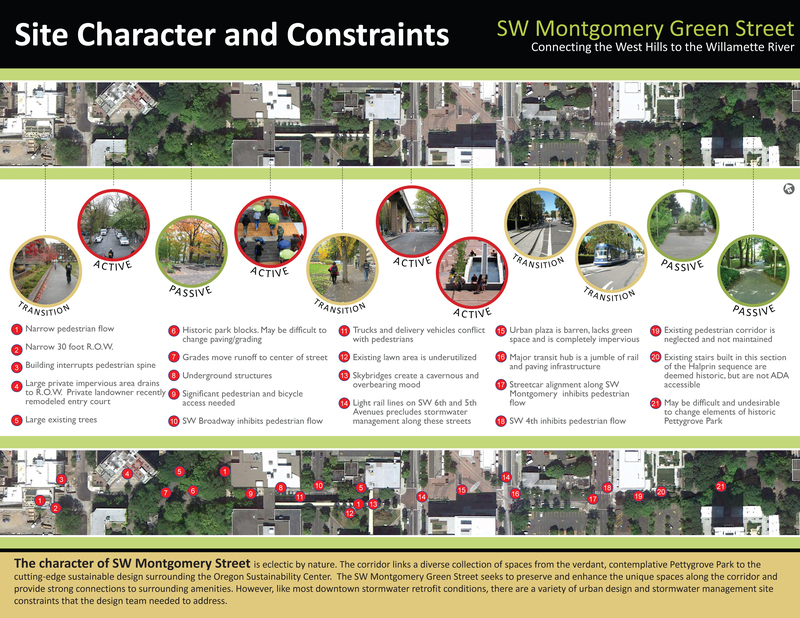 These areas should be expected to lead early redevelopment efforts along the SW Montgomery Green Street. 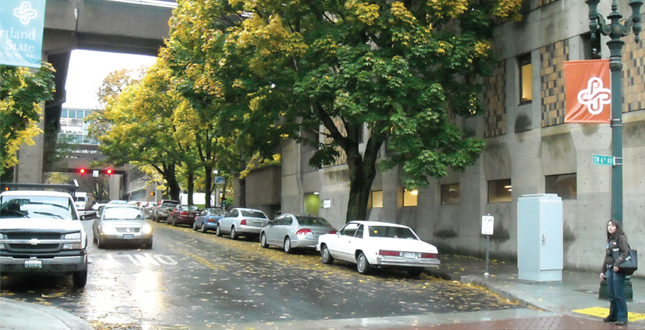 Portland’s 1988 Central City Plan designated SW Montgomery Street as a key east/west pedestrian corridor. In the last five years, there has been a concentrated effort by the City of Portland, Portland State University, private developers, and businesses to implement simultaneous multi-block development and redevelopment along SW Montgomery Street. The strategic convergence of these elements will successfully activate the neighborhood, enhance the pedestrian experience, foster sustainability, continue to build a community culture, and dramatically build upon the long-term efforts advanced over the past four decades. The character of SW Montgomery Street is eclectic by nature. The corridor links a diverse collection of spaces from the verdant, contemplative Pettygrove Park to the cutting-edge sustainable design surrounding the Oregon Sustainability Center. 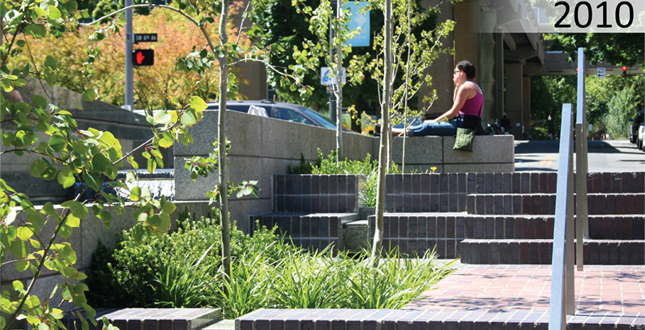 The SW Montgomery Green Street seeks to preserve and enhance the unique spaces along the corridor and provide strong connections to surrounding amenities. However, like most downtown stormwater retrofit conditions, there are a variety of urban design and stormwater management site constraints that the design team needed to address. The highest caliber green street looks beyond only managing stormwater runoff. It also promotes a transportation mode switch from primarily auto-centric design to a street that emphasizes alternative transportation. 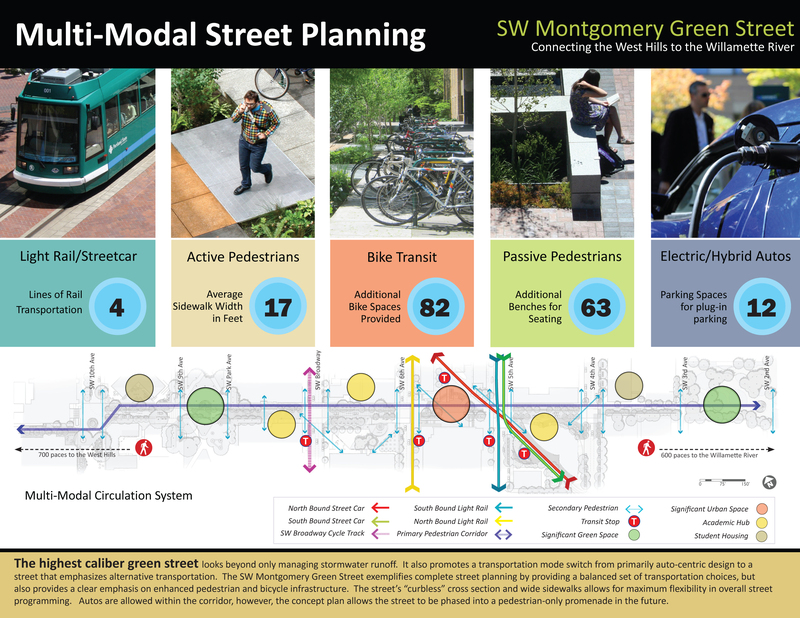 The SW Montgomery Green Street exemplifies complete street planning by providing a balanced set of transportation choices, but also provides a clear emphasis on enhanced pedestrian and bicycle infrastructure. 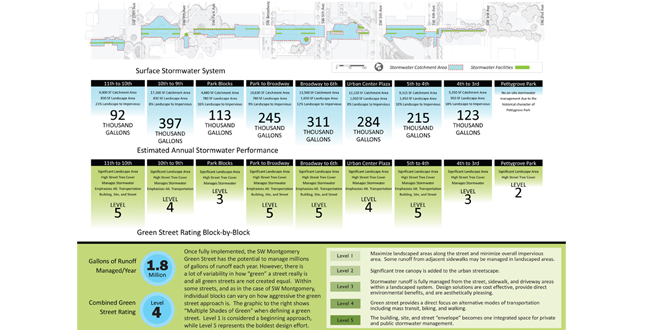 Stormwater management along the SW Montgomery Green Street is not a one-size-fits-all condition for each block of the corridor. In many cases, the street’s “stormwater spine” will not be able to infiltrate stormwater runoff due to underground utilities or structures and may force the use of flow-through stormwater facilities. This of course does not preclude using a landscaped-based system of stormwater management. 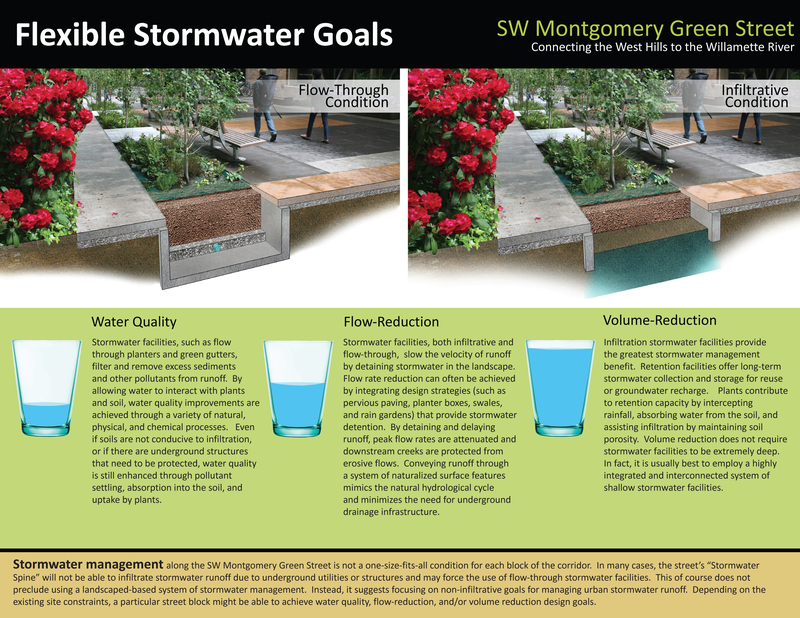 Instead, it suggests focusing on non-infiltrative goals for managing urban stormwater runoff. 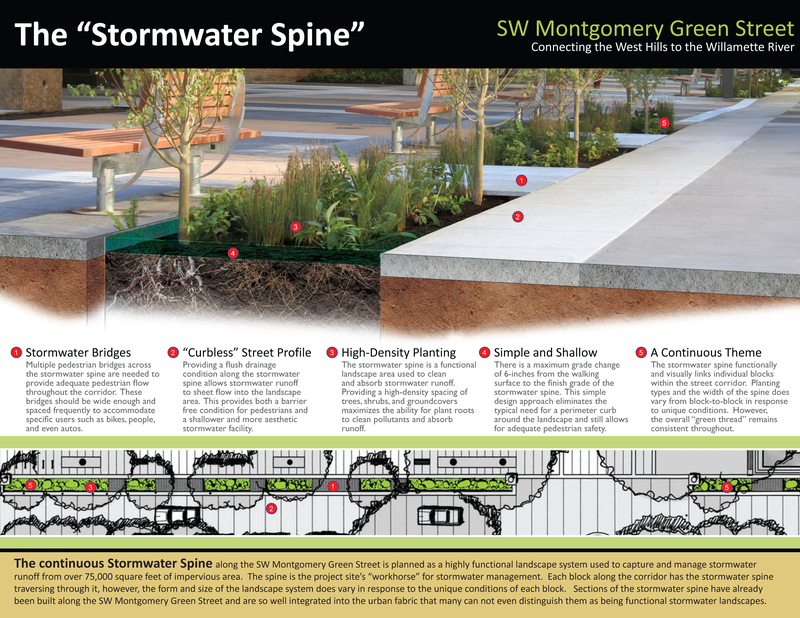 The continuous stormwater spine along the SW Montgomery Green Street is planned as a highly functional landscape system used to capture and manage stormwater runoff from over 75,000 square feet of impervious area. The spine is the project site’s “workhorse” for stormwater management. Each block along the corridor has the stormwater spine traversing through it, however, the form and size of the landscape system does vary in response to the unique conditions of each block. 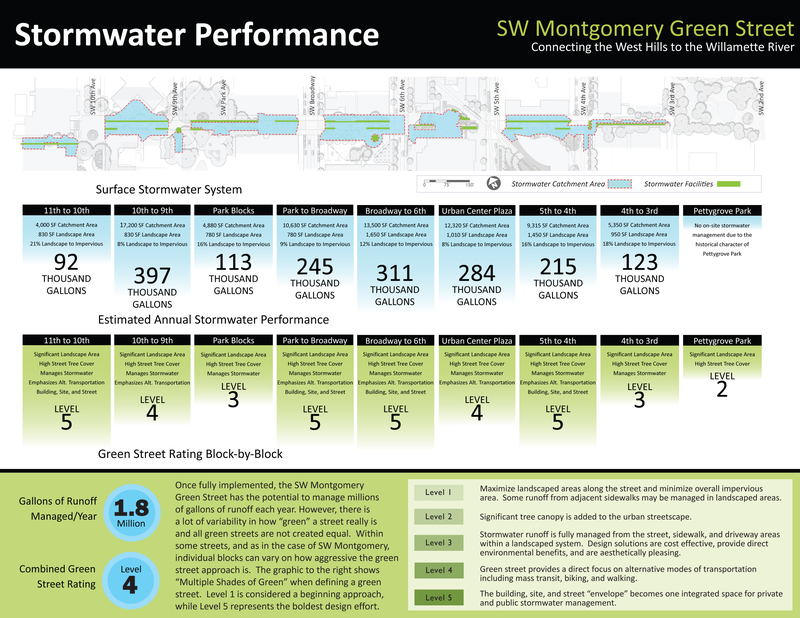 Once fully implemented, the SW Montgomery Green Street has the potential to manage millions of gallons of runoff each year. However, there is a lot of variability in how “green” a street really is and all green streets are not created equal. Within some streets, and as in the case of SW Montgomery, individual blocks can vary on how aggressive the green street approach is. Opportunities abound on all of the blocks within the SW Montgomery Green Street to manage stormwater runoff in a more sustainable way. However, the three blocks that currently carry auto traffic hold a special opportunity to transform the auto-based vernacular into an enhanced pedestrian condition that connects to urban and green spaces surrounding the project area. In addition, many of the existing buildings along the corridor are poised for redevelopment or reuse. 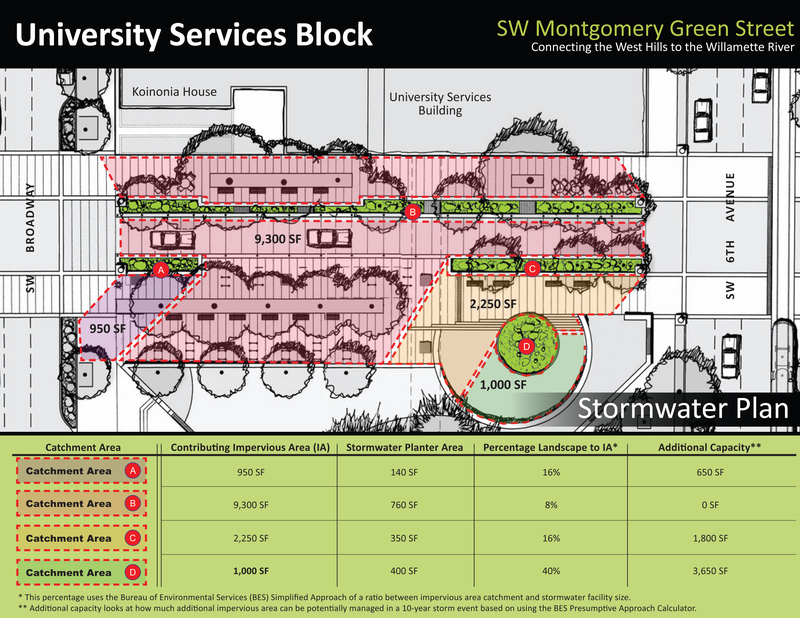 When redevelopment does occur, there will be the potential to capture stormwater runoff from these areas and redirect it into the SW Montgomery Green Street’s landscaped system. 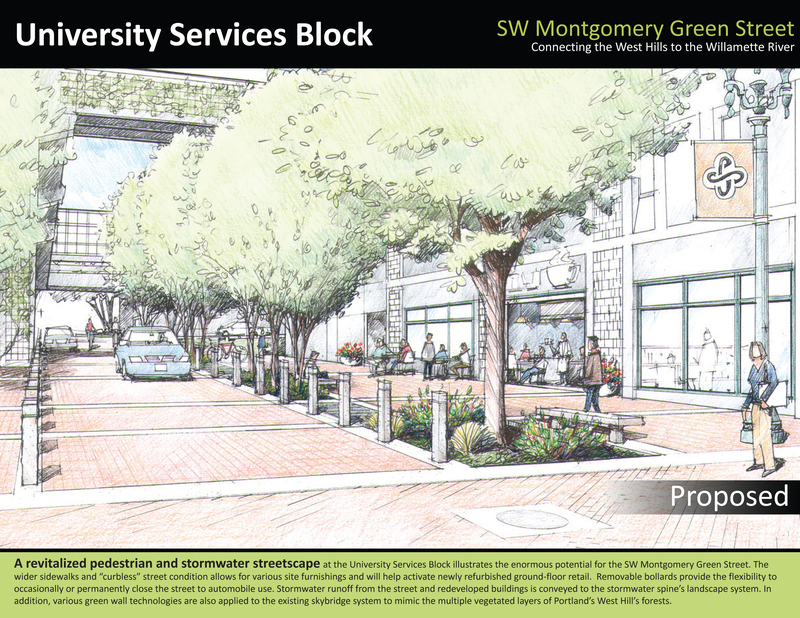 A revitalized pedestrian and stormwater streetscape at the University Services Block illustrates the enormous potential for the SW Montgomery Green Street. The wider sidewalks and “curbless” street condition allows for various site furnishings and will help activate newly refurbished ground-floor retail. Removable bollards provide the flexibility to occasionally or permanently close the street to automobile use. 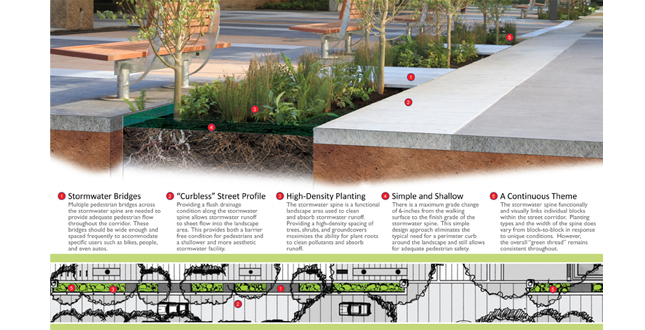 Stormwater runoff from the street and redeveloped buildings is conveyed to the stormwater spine’s landscape system. 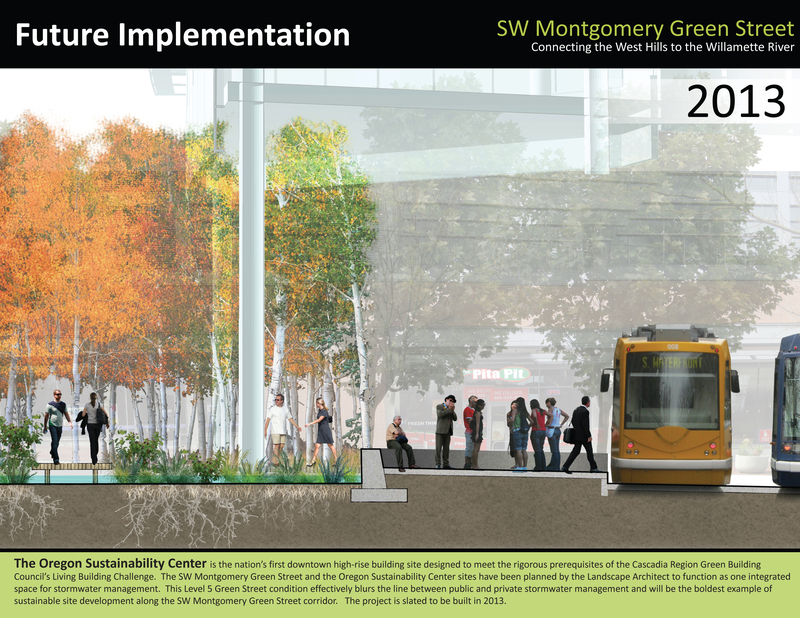 In addition, various green wall technologies are also applied to the existing skybridge system to mimic the multiple vegetated layers of Portland’s West Hill’s forests. This concept plan rendering for the University Services block illustrates an example of how the corridor’s street envelope is redesigned to properly balance different modes of transportation and also provide multiple opportunities to capture stormwater runoff from the street and adjacent buildings. 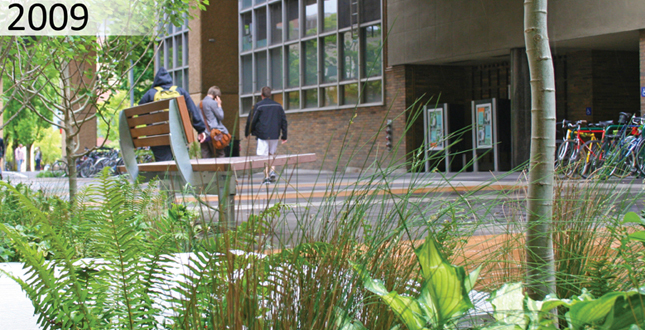 Stormwater runoff at the University Services block is captured through a series of landscaped facilities with the stormwater spine acting as the primary management tool. The graphic and table illustrates the relationship between landscape area and impervious area. This analyses was completed for the entire project corridor. 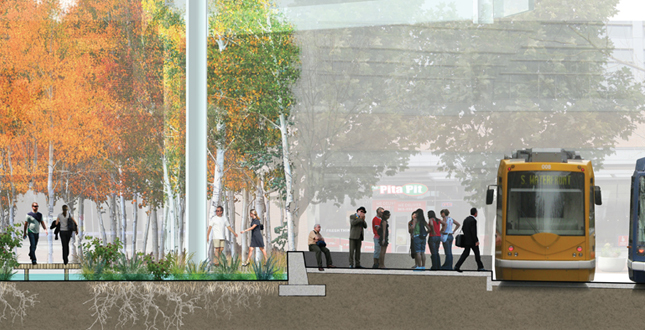 The Urban Center Plaza was the second block to undergo a retrofit under the SW Montgomery Green Street Concept Plan. 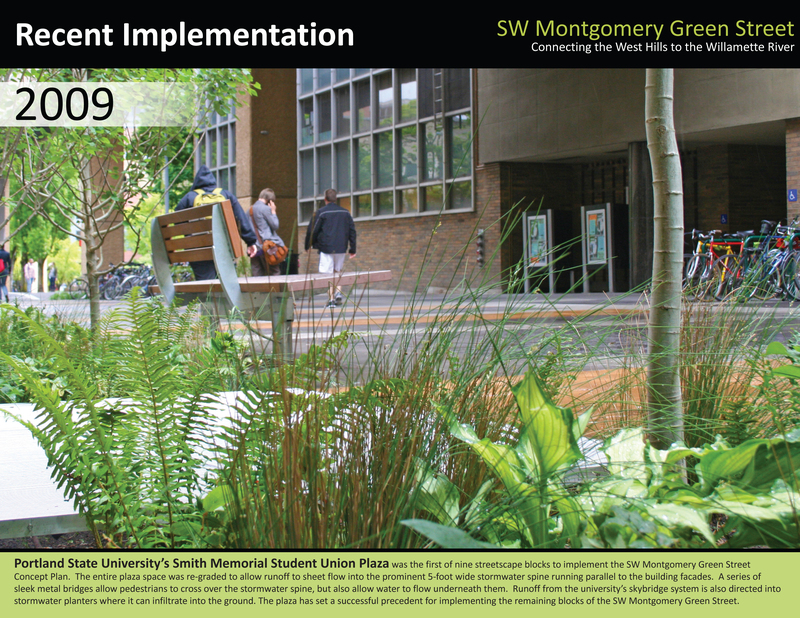 Portland State University’s rebuilt plaza now features three stormwater planters strategically placed next to the original water fountains to reinforce the stormwater spine element of the SW Montgomery Green Street. Approximately 8,000 square feet of runoff is captured from the plaza and adjacent sidewalks and is conveyed through a series of trench drains into the stormwater facilities. 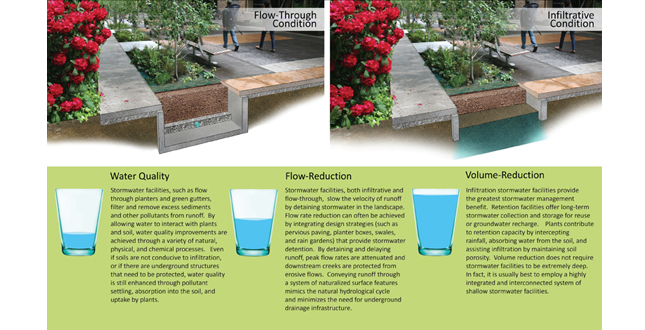 A visual showcase, the stormwater cascades from planter to planter through metal weirs and granite rills. The Urban Center Plaza retrofit provides a delightful display of water, plant life, and urban space. 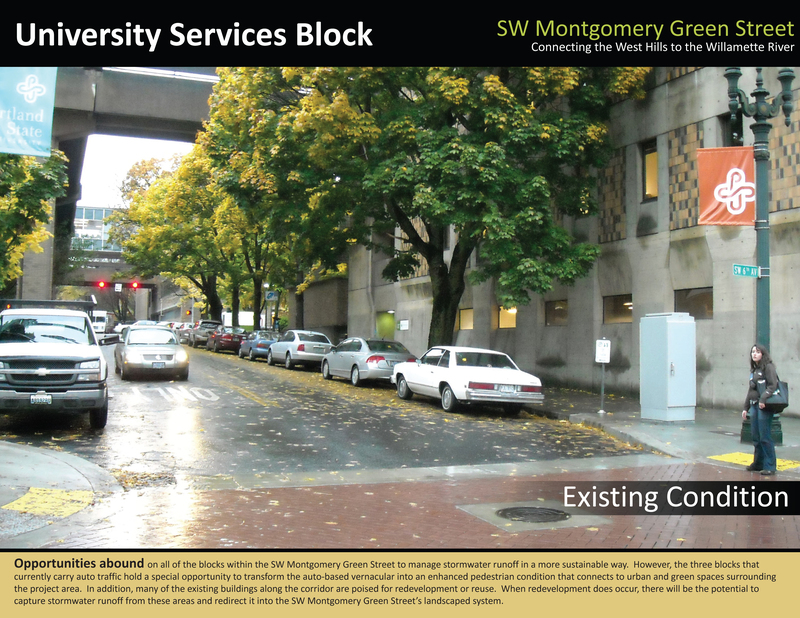 Portland State University’s Smith Memorial Student Union Plaza was the first of nine streetscape blocks to implement the SW Montgomery Green Street Concept Plan. The entire plaza space was re-graded to allow runoff to sheet flow into the prominent 5-foot wide stormwater spine running parallel to the building facades. A series of sleek metal bridges allow pedestrians to cross over the stormwater spine, but also allow water to flow underneath them. Runoff from the university’s skybridge system is also directed into stormwater planters where it can infiltrate into the ground. 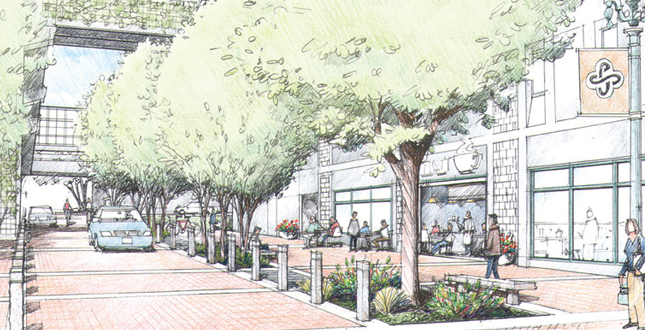 The plaza has set a successful precedent for implementing the remaining blocks of the SW Montgomery Green Street. The Oregon Sustainability Center is the nation’s first downtown high-rise building site designed to meet the rigorous prerequisites of the Cascadia Region Green Building Council’s Living Building Challenge. 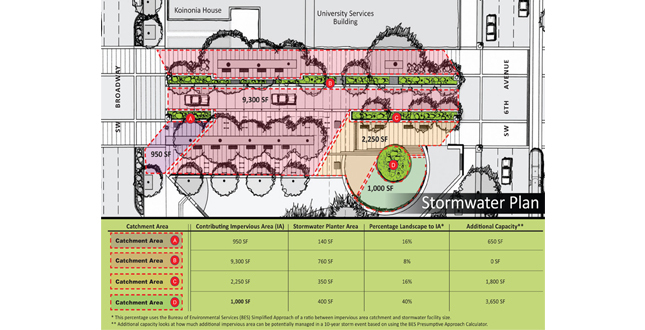 The SW Montgomery Green Street and the Oregon Sustainability Center sites have been planned by the Landscape Architect to function as one integrated space for stormwater management. This Level 5 Green Street condition effectively blurs the line between public and private stormwater management and will be the boldest example of sustainable site development along the SW Montgomery Green Street corridor. The project is slated to be built in 2013. 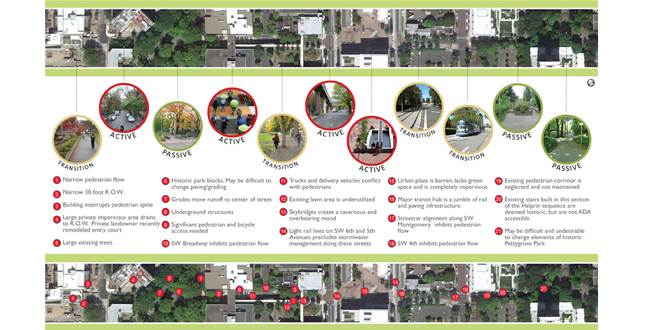 The SW Montgomery Green Street demonstrates an emerging new urban street plan for which Portland is receiving national and international recognition. This multi-block plan incorporates a variety of green infrastructure and alternative transportation strategies throughout this emerging downtown neighborhood. The Southwest Montgomery Green Street is considered to be Portland’s boldest and most innovative downtown green street project to date. Through a collaborative effort, the Portland Development Commission (PDC), Portland’s Bureau of Environmental Services (BES) Portland State University (PSU), and Gerding Edlen Development, are pursuing a 9-block plan that incorporates a variety of sustainable stormwater management strategies from SW 11th Avenue east to Pettygrove Park via SW Montgomery Street. 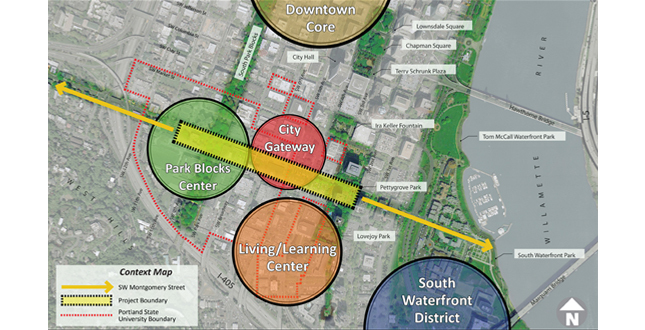 The Portland Central City University District Plan emphasizes the development of this neighborhood as an area where University uses mesh with City of Portland goals and designates SW Montgomery Street as a key east/west pedestrian corridor. Simultaneous multi-block development and redevelopment along SW Montgomery Street will dramatically build upon the long-term efforts advanced by the City, PSU, private developers, and businesses over the past four decades. 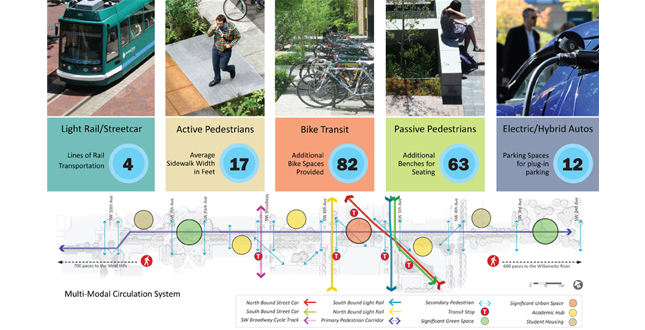 The strategic convergence of these elements will successfully activate the neighborhood, enhance the pedestrian experience, foster sustainability, and continue to build a community culture. 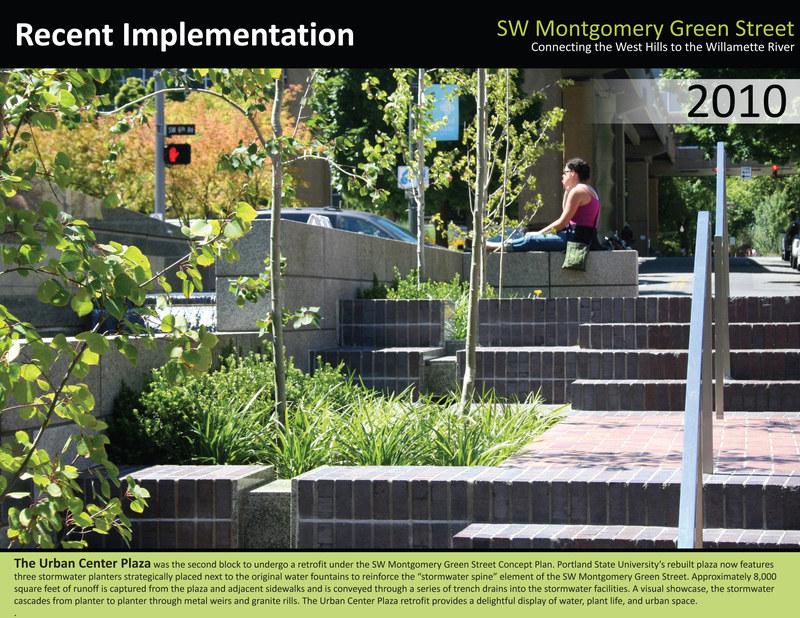 The SW Montgomery Green Street Plan demonstrates how, in even the most ultra-urban conditions, downtown streets can be planned and retrofitted not only to fully manage stormwater runoff but to also create, integrate, and preserve vibrant pedestrian spaces. The landscape architect was asked to take the primary role creating a highly integrated and pedestrian-oriented urban streetscape vision that incorporates a variety of green infrastructure strategies along the corridor including stormwater swales, planters, green walls, green roofs, artful stormwater conveyance, and a definitive “curbless” street design. Using the SW Montgomery Green Street to connect the overall area to an Eco-district. Retrofit green street elements along the project corridor, while honoring the character found particularly at the South Park Blocks, Urban Center Plaza, and Pettygrove Park. 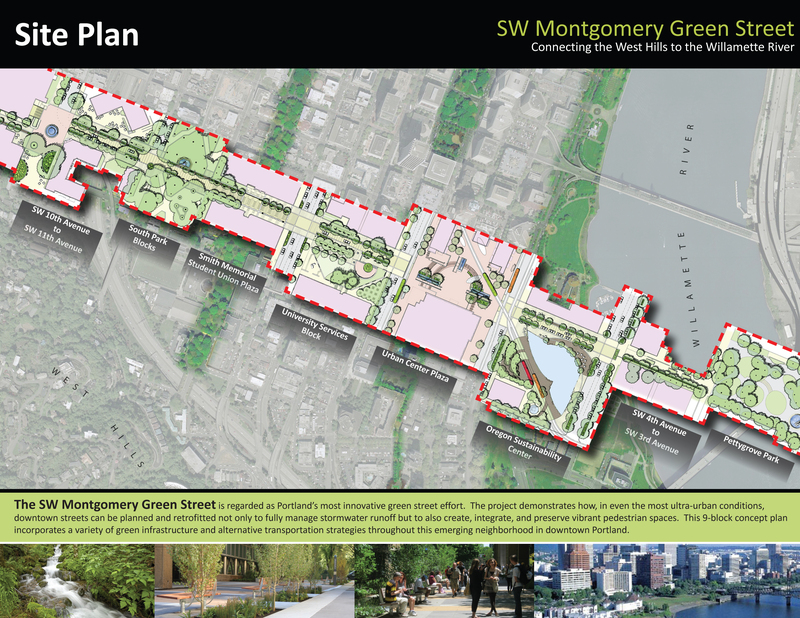 To fully realize the plan for the SW Montgomery Green Street, the landscape architect was asked to study the project’s site character, determine the project’s overall stormwater management goals, investigate and respond to the site’s constraints, determine how bold of a green street is possible, and analyze the different modes of circulation throughout the neighborhood. This analysis provided the opportunity for 1.8 million gallons of stormwater runoff to be managed through the street’s “stormwater spine,” the potential for a significant transportation mode shift from auto-infrastructure to people-infrastructure, and the ability to have the street itself catalyze sustainable private redevelopment along the SW Montgomery Green Street corridor. 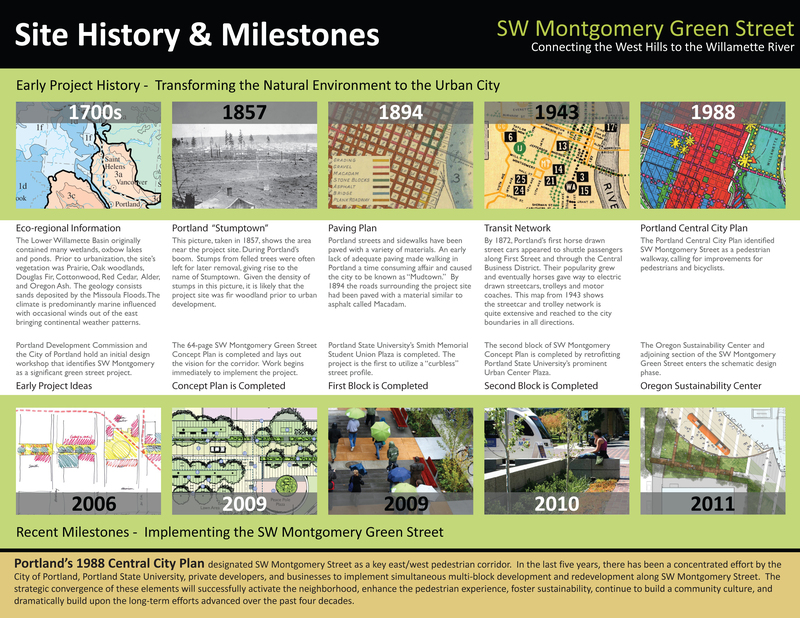 The final product of these analyses is the creation of the SW Montgomery Green Street Plan which has proven to be highly implementable both in the near and long-term. 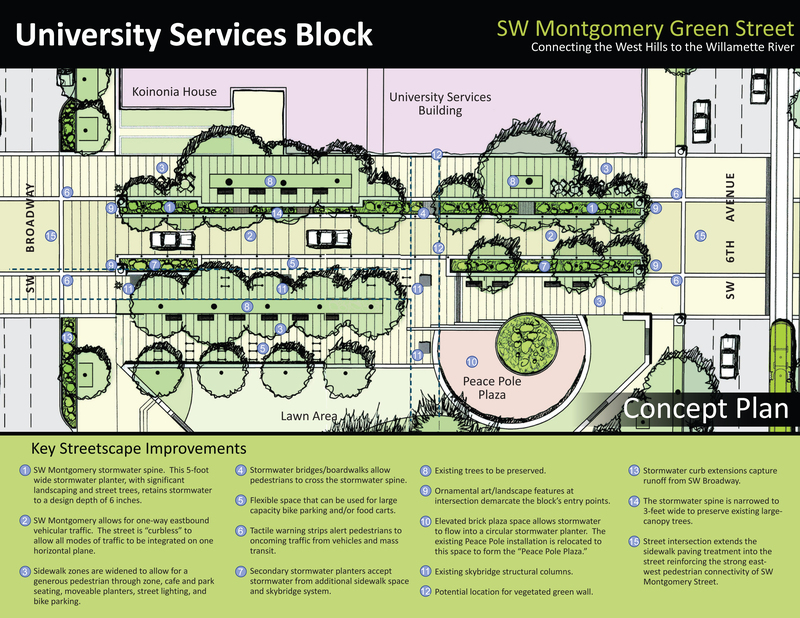 The SW Montgomery Green Street Plan is being implemented in multiple phases. 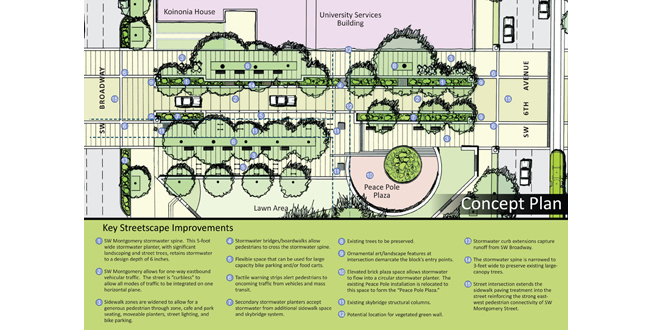 Two blocks of the plan, the Smith Memorial Student Union Plaza and the Urban Center Plaza Retrofit, have been successfully completed by the landscape architect’s design team. Two additional blocks are targeted for implementation within the next two years, including the proposed Oregon Sustainability Center- Portland’s most technologically advanced, state-of-the-art green building site that aims to meet the rigorous criteria of the Living Building Challenge. With the strategic convergence of various partners and continued planning and implementation efforts, the SW Montgomery Green Street corridor will successfully activate the neighborhood and foster sustainability as a relationship between academic, residential, and business communities. 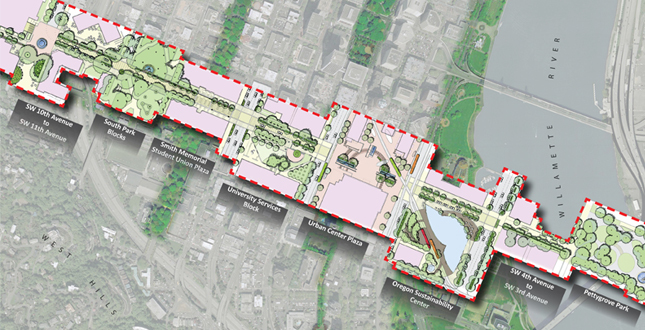 This project’s implementation will serve as a new concept for street planning and a place-making model for other downtown streetscape projects in Portland and beyond.